All proceeds from food sales in the International Food Court will go to charity. 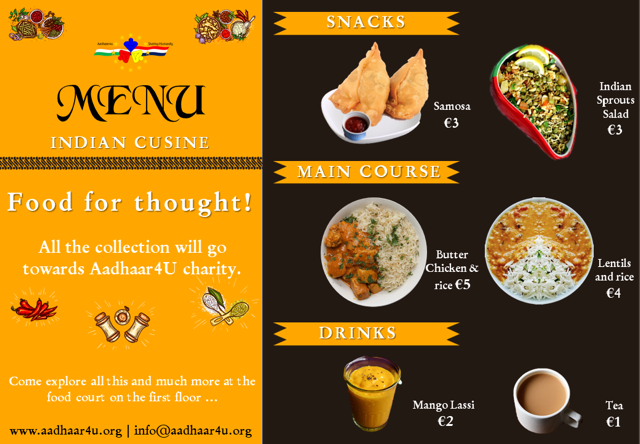 Sample delicious Indian cuisine and show your support for our community fundraisers! Founded in 2006, Aadhaar4U believes that all human beings have a right to live with dignity and respect. The Hindi/Marathi word ‘Aadhaar’ means support. As the name suggests, Aadhaar4U endeavours to “support” you in “supporting” a destitute group of people who are mostly neglected in day-to-day life due to poverty, handicaps, and social myths. The organisation is committed to providing Aadhaar to these needy groups.